Prenatal Blood Test- tests for anemia, blood type, and antibodies. Blood & RH Type- tests to determine your blood type (O, A, B, or AB) and your Rhesus (Rh) factor which is either + or -. Women who are Rh- and their baby’s father is Rh+ will need RhoGAM injections to prevent future antibodies which could harm their current or future pregnancies. The first injection is done at week 28. Infection testing- blood tests for Hepatitis B, syphilis, and HIV and urine screening for other types of infections. Some local providers test for hepatitis C if the client desires a water birth. Diabetes Screening- this test is typically done in two parts if necessary. Part one is standard for all pregnant women. Part two is only done if the first test results are high, in which case the 3-hour test may be performed to verify or discount diabetes in pregnancy. The test is usually done in the second trimester. 1st trimester ultrasound- a vaginal probe is used to verify the pregnancy for health and/or dating. AFP screen- also called the quad screen. Typically done at 16-18 weeks, to rule out 70%+ of all serious genetic disorders. If testing revels any concerns, then further testing is done with ultrasound or amniocentesis. Harmony Prenatal Test- a non-invasive blood test for common genetic conditions. 2nd trimester ultrasound- performed between 18-20 weeks to take an in-depth view of the baby’s development and gender, if desired. Genetic carrier testing- depending on family history or ethnic background, genetic testing may be offered or recommended. Examples of common genetic conditions include: cystic fibrosis, sickle cell anemia, or Tay-Sachs. 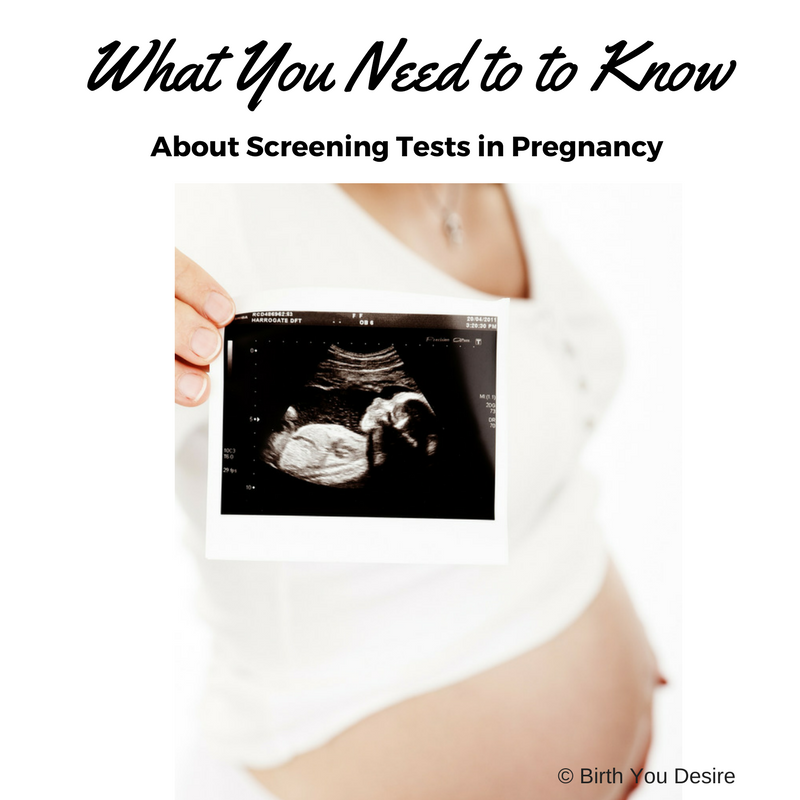 If the mother tests positive, then oftentimes the partner will undergo testing. If both parents test positive then further consultation will be recommended. It is also common for Maternal Fetal Medicine to recommend genetic testing if there is a history of miscarriages or complications. Group B Strep (GBS) culture- around 35-37 weeks, a vaginal and rectal swab is done to test for bacteria present in 25%+ of all women who are benign carriers. In rare cases GBS can cause serious harm to babies. NIPT (Non-Invasive prenatal testing)- is done using a maternal blood sample to analyze serious genetic conditions such as Down Syndrome. This test is very safe with a high detection rate. CVS (Chorionic villus sampling)- done around week 10-12 for women over 35 years of age, where ultrasound guides a small catheter into the placenta for a sample. The sample is then analyzed for genetic conditions and gender. The test has a 90% accuracy rate but comes with a 1:200 miscarriage rate. CVS collects larger samples and provides faster results than amniocentesis. NT (Nuchal Translucency)- is an ultrasound test at 11-14 weeks to screen for Down Syndrome. The test has a 60+% accuracy rate. Amniocentesis- is best performed between 16-20 weeks, the test is used for a variety of reasons. Guided by ultrasound, a needle takes a sample of amniotic fluid which is analyzed for genetic conditions. The test has the highest accuracy rate over 99% and carries a 1:200-300 miscarriage rate. This information is shared for education purposes only. Please speak with your provider about your individual situation.